I have always been interested in Hansie Cronje. As younger boy growing up Hansie was a great nemesis of the Aussie cricket team. But he was also a Christian. This fact made it extra interesting when in the early part of this century (2000s) it was revealed Cronje had gotten himself mixed up in the bookmaker crowd and was given money by bookmakers to ensure them favourable results, amongst other things such as pitch information. I remember then a few years after this hearing one morning that Hansie Cronje had died in a plane crash. What a fascinating story. 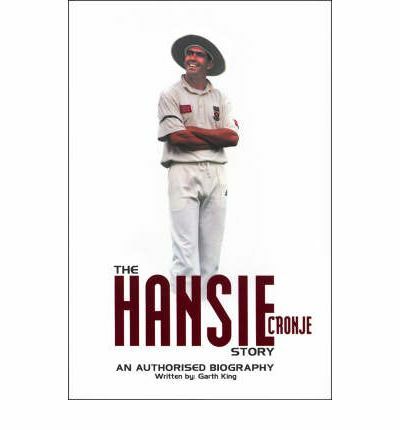 So when I was in Koorong a while ago and saw, The Hansie Cronje Story I picked it up and read it with interest. I think my first reflection would be that this book is not worth reading unless you know who Hansie is and are interested in just how he could fall so spectacularly from grace as he did. My other main problem with the biography was it was occasionally preachy. It would move from talking about Cronje and his faith into a little gospel presentation and then back into the story. In fact the last chapter is almost entirely of this nature. I've got no problem with preaching the Gospel, however the way this book did it seemed often awkward. It was also obvious this book was written at the request of the family as Cronje's flaws were easily forgiven and his best features sung with much praise. I also feel a nervous even criticising the book at all because it's obvious as you read that the family and friends of Cronje don't take well to all the criticism that Cronje recieved - unjustified as much of it probably was. In this book then you get the picture of Cronje being an intensely driven man. Driven to succeed in whatever he did. He made his first real commitment to becoming a follower of Jesus after he ran over and killed a child whilst driving on a freeway to an interstate cricket game. It seems with the pressures of international cricket he waxed and waned in intensity of his faith and had some sort of crisis of faith after the bookmaking/match fixing scandal came out in public. In the 2 and a bit years he lived after this scandal that bought him down from the heights of well loved cricket captain he got his relationship with his wife and his creator back on track. In many ways he died at exactly the right moment. And that's really what I take away from this book. Our days are numbered and God knows when they will be up. I don't think Hansie really could have lived a long happy life been baned from cricket (the game he loved) and still knowing he had let down his friends and family and country so badly by getting involved with the bookies. But after the scandal broke God gave him enough time to make some restitution for his sins and to clear the slate. It was at this moment he was taken home. It was sad that he died, but in many ways a happy ending. I pray that when my time is up, I too will have my house in order.